Great for breakfast biscuits, whether premade, frozen, or also cooked from scratch. I love biscuits and gravy as an alternative to pancakes for breakfast. Crumble and brown sausage in a saucepan (e.g. Farberware Classic 2-Qt. Covered Double Boiler). Should take 3-5 minutes. Drain half of the grease from the pan. Set stove to medium heat. Add flour and stir until completely mixed. Slowly pour in milk while continuing to stir. Add salt and pepper to taste. Increase heat to med-high to thicken the sauce for 3-5 minutes. Pour gravy over prepared biscuits and enjoy. 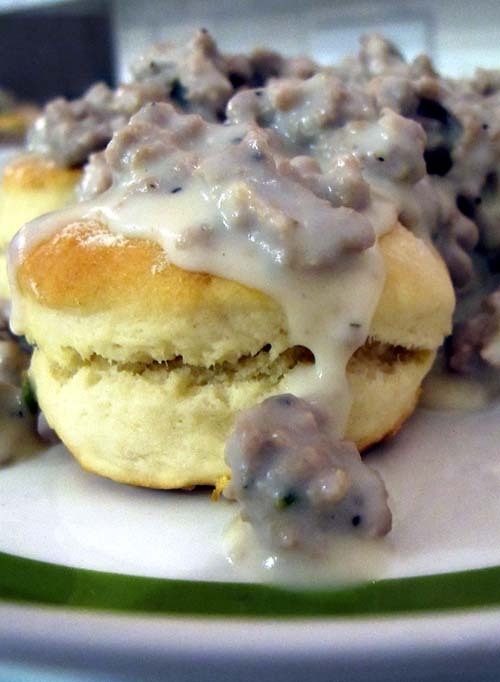 Here's a recipe for homemade biscuits from scratch to go with sausage gravy.